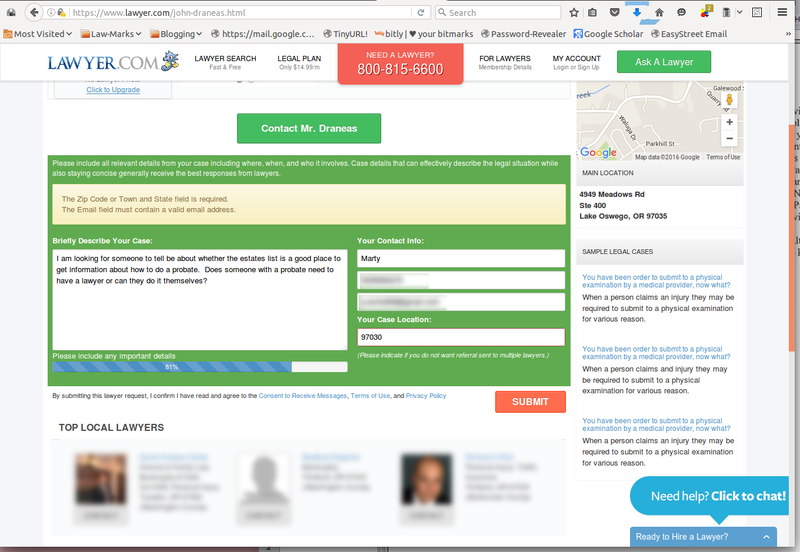 You go to a website seeking a lawyer, you find a name and decide to contact that lawyer, you fill in some personal information about your case, and click the “submit” button. Where does it go? 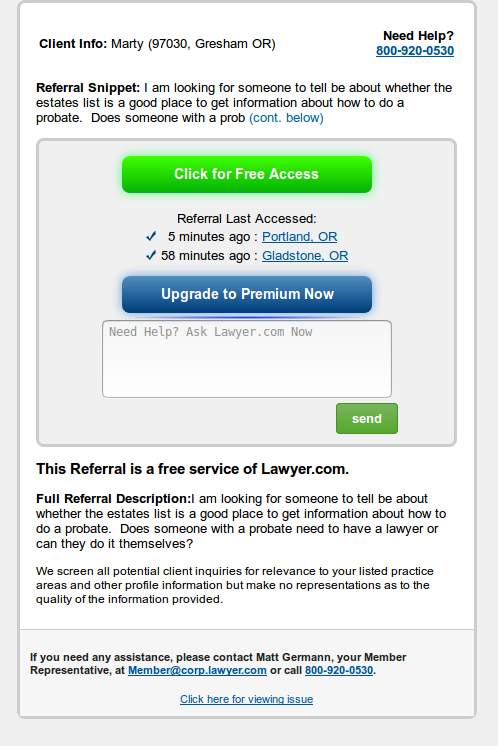 There are lots of services that provide referrals to potential clients seeking lawyers. 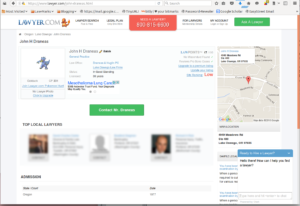 This post is about one of them “Lawyer.com.” Below I detail my test of website behavior that is, in my opinion, misleading to potential clients at best, and dangerous at worst. This post is not about Lawyers.com It is a different website run by a different company. Notice that I am not talking about “Lawyers.com” (the plural version). I have not checked and can’t comment on the behavior of Lawyers.com. 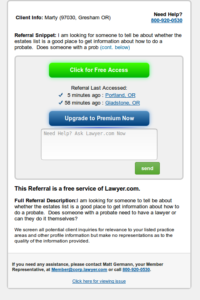 Anyone seeking to find a lawyer using one of these websites should consider this a cautionary tale. There are a lot of ways that a potential client can decide on a lawyer. 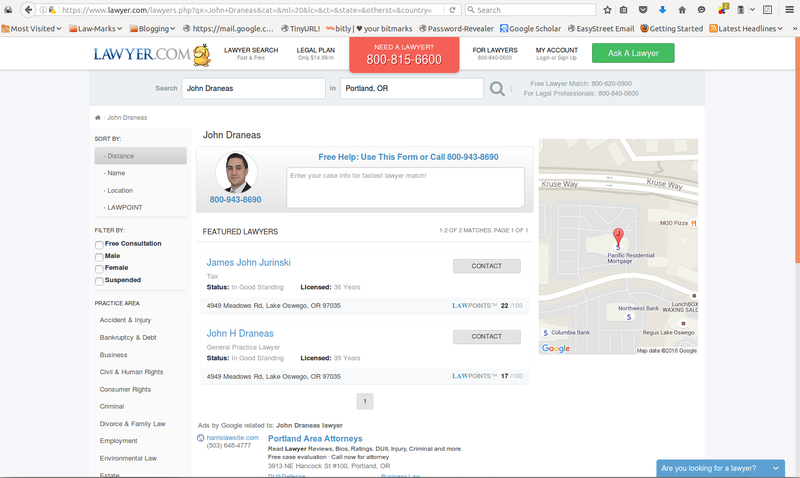 For this scenario, lets imagine a prospective client “Marty” who is seeking a lawyer, sees a list of names on Lawyer.com, and recognizes John Draneas. (I use John as an example for a couple of reasons. He really is a fine estate planning lawyer, I really did use him in my test, I knew that I could ask him if he got an email suggesting he contact Marty, and he said I could.) We could see the same scenario for an existing client looking for a lawyer’s contact information to send confidential information to that lawyer. If you take a look at that image, you will see that there is a “contact” button to the right of John’s name. Marty decides that he wants to know more about John, or maybe get a phone number. Rather than click on the contact button, he clicks on John’s name. This takes him to another page that has John’s information it. Name at the top, a map of office location, but no phone number and no email address. Bummer! Fortunately, there is a helpful button that says “Contact Mr. Draneas”. So Marty clicks on the button and starts thinking about what he wants to say to his lawyer. The warning is the smallest font on the form, and who is looking for it anyway? What happens next? The user gets a page saying to stay near their phone and expect to hear from a lawyer soon. What? “I thought I was contacting John!” If you look at that image, you will see that there is warning text. 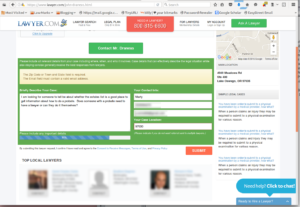 It says that you will be contacting multiple lawyers and also says “Please indicate if you don’t want referral sent to multiple lawyers.” But there is no suggestion of how to “indicate” what you want. Remember how we got here. 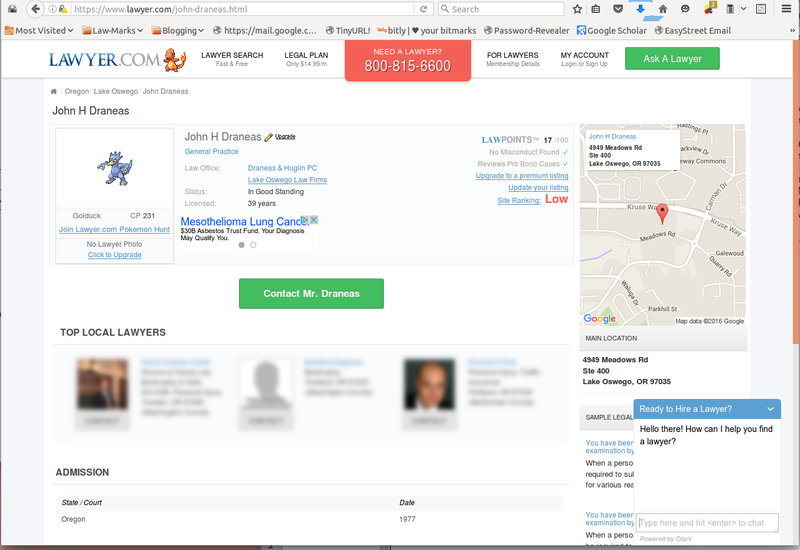 To get to the referral form, you either click “Contact” next to John’s name, or your click on “Contact Mr. Draneas” on his profile page. After conducting this test, I mentioned what I was doing to some of my estate planning colleagues. Several of them emailed and let me know that they had received a message from Lawyer.com inviting them to contact Marty. In fact I received one myself. I get several of these each week. I had always thought it came because someone had asked to talk to me, or asked for a referral to anyone who matched their search. I still haven’t heard from Marty, although everybody else in town has. The danger of this practice can’t be overstated. Users are encouraged to share confidential information with inadequate warnings. It is dangerous because a potential client who thinks that they are talking with a particular lawyer, will get their information sent to someone else. Potentially a lawyer already representing the other side of their case or transaction. Even if Marty is normally a person of few words, there is the progress bar “rewarding” him for adding more information and details. Once posted and shared on line, Marty’s secrets are not so secret anymore. This post should be a cautionary tale. Protect yourself. Don’t share confidences or secrets on websites. 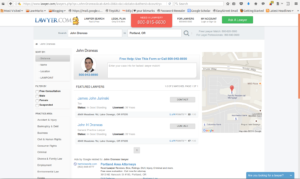 I don’t know about other referral websites and whether they have similar practices. I hope not. This one and the behavior was called to my attention. And I have enough concerns that I wrote this post. This post should be a cautionary tale. Protect yourself and don’t share confidences or secrets on referral websites. Clients and prospective clients should make certain that they are talking to their lawyer, and no one else. I also recognize that others who interact with their site, even lawyers, may have a different opinion about whether the site is misleading or dangerous. This post expresses my opinion only. If anyone has blogged this issue and has a different opinion, let me know and I’ll link to reasonable commentary.